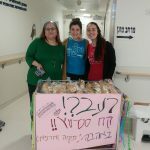 This morning, volunteers from Tikva Umarpe תקווה ומרפא gave out sandwiches in honor of Rosh Chodesh Adar Aleph (the new month of Adar) in our Wilf Children’s Hospital. 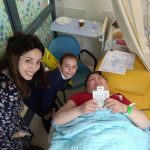 In addition, Tikva Umarpe brought a very special girl, Halley Krisenstein to Shaare Zedek. 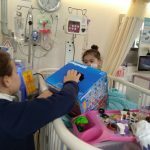 This goodhearted ten year old girl decided to use money she received for her birthday to buy special toys that she gave out to our young patients in the Lesley and Leon Berman Paediatric Dialysis Unit. 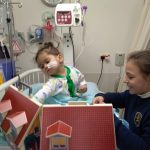 As she walked over to each child’s bed, she carefully selected a present she thought they would enjoy. 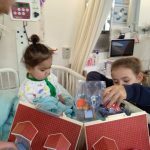 It was wonderful to see the patient’s eyes light up as she gave them the magnificent toys. We wish everyone a Happy Adar Aleph and thank Tivka Umarpe and all of their volunteers for helping our patients start Adar with so much simcha (happiness)!